I think quiche is a forgotten pastime. That's unfortunate because it's really an easy dish to hold any kind of vegetable. It's a perfect light lunch or dinner with a salad. I removed the crust to make it lighter and take away the guilt. So, is it breakfast or a dinner.....either way, it reheats nicely. Get creative and add sliced tomatoes or serve with a little tomato sauce drizzled over. 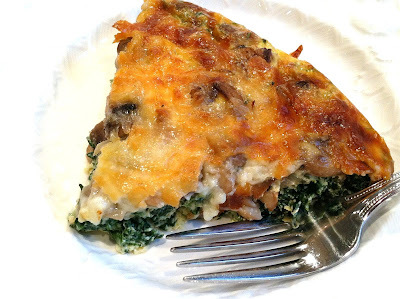 Mushroom and Spinach who needs a crust quiche! Saute the mushroom and scallion until the liquid is gone. Layer the spinach than the mushroom mixture. Add the cheeses spread evenly over the top. Spinach and Mushroom Quiche without the Crust. Preheat the oven to 350 degrees. Bake for 45 minutes or until golden on top. 1. Thaw the frozen spinach and squeeze it so the water comes out. Slice the mushrooms and place in a skillet coated with non-stick spray, add the minced garlic, chopped shallot, salt, and pepper. Turn the heat on to medium-high and saute the mushrooms until they release all of their moisture and no more water remains on the bottom of the skillet (5-7 minutes). 2. Spray a pie dish with non-stick spray. Squeeze the rest of the water out of the spinach and spread it out on the bottom of the pie dish. Next add the cooked mushroom mixture and than the crumbled feta or goat cheese. 3. In a medium bowl whisk together the eggs, milk, parmesan, thyme, and another small sprinkle of pepper. 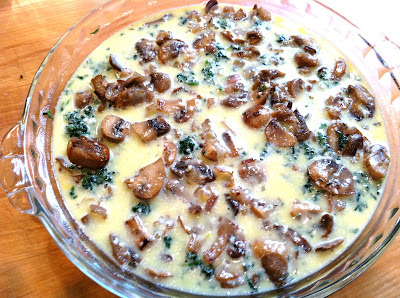 Whisk to combine and pour this mixture into the pie dish over the spinach, mushrooms, and goat cheese (feta). 4. Sprinkle the shredded cheeses cheese over top. Place the pie dish on a baking sheet for easy transfer into the oven. 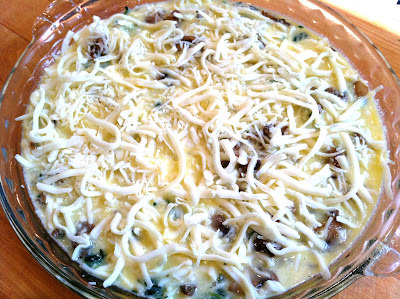 Place the quiche into the preheated oven and bake until it is golden brown on top and the center is solid.